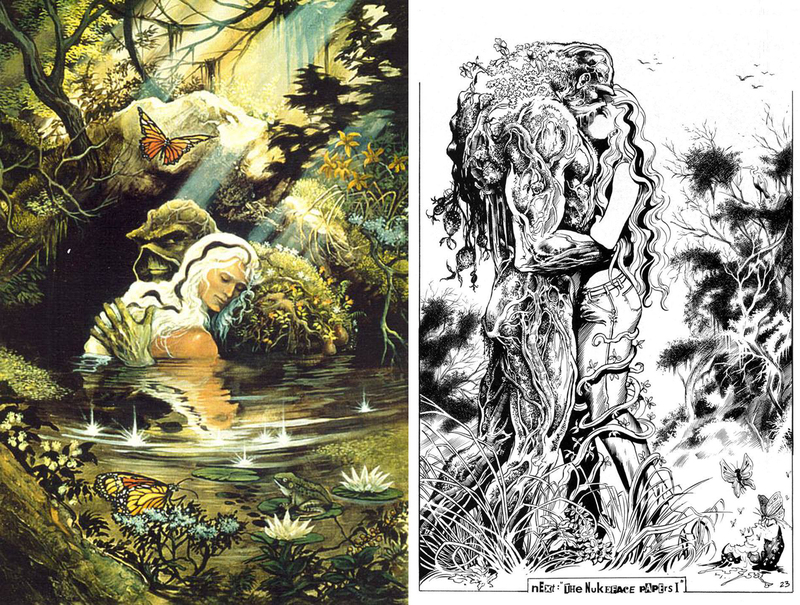 With SWAMPMEN out this week (from Jon B. Cooke, George Khoury, TwoMorrows, 2014), it’s time to remind everyone in the community that the painted cover art to SAGA OF THE SWAMP THING #34 and the final page of that issue (“Rites of Spring”) are STILL STOLEN PROPERTY. These belong to John Totleben and yours truly, Stephen Bissette—only they don’t, because they were stolen right out of the DC Comics offices in 1984-85. These are STILL STOLEN PROPERTY. Anyone owning, trafficking, trading, or harboring this original art—SOTST #34 cover painting and the final story page—is involved (knowingly or unknowingly) in criminal activity. John and I also have children; mine are now adults. They are looking, too. Even after we’re dead and gone, this will be sought-after STOLEN PROPERTY. Note: Comic book writers and artists who work for companies like Marvel or DC are required to sign work-for-hire contracts which seriously restrict the income they can earn from the properties they work on and characters they create for those companies. An important source of revenue for artists is the sale of their original art. Stolen art takes away a vital means of support for the artist that created it. If you have any info on the artwork shown, Stephen Bissette can be reached though his Facebook page or on Twitter. This entry was posted in Steve Bissette and tagged Stephen Bissette, Stolen Artwork. Bookmark the permalink.